How to watch LEGO: Marvel Super Heroes: Maximum Overload (2013) on Netflix Austria! 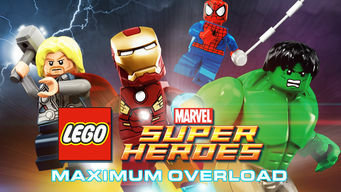 Yes, LEGO: Marvel Super Heroes: Maximum Overload is now available on Austrian Netflix. It arrived for online streaming on October 15, 2017. We'll keep checking Netflix Austria for LEGO: Marvel Super Heroes: Maximum Overload, and this page will be updated with any changes. Villainous Loki is amassing an army to conquer Earth! His antics are keeping Spider-Man and S.H.I.E.L.D. busy as they tackle a host of bad guys. A team of your favorite superheroes goes up against a swarm of evil villains. And they're all LEGOs!